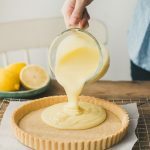 To make the lemon curd: In a medium heatproof bowl, place eggs, sugar, lemon zest, lemon juice, and heavy cream and whisk to combine. Place the bowl over a saucepan of simmering water (bain-marie). Cook on moderate heat, whisking constantly, until mixture becomes thick (mine was ready in 10 minutes, but it can take up to 20). If you have a thermometer, it should register 170°F/75°C; otherwise, it should coat the back of a wooden spoon and leave a clear pass if you run your finger through it. The curd will thicken more once cooled. Fill the tart shell with lemon curd, then refrigerate for at least 4 hours until chilled. Serve with berries and whipped cream if you like. The tart is rich, so cut your servings small.